Excitement is drawing near. It’s Contest Season again at Toastmasters all around the world. We start at club level and work our way up through Area, Division, District until the International World Convention. Join us for a fun event. The Spring Contest for “International Speech and Evaluation” will be taking place on March 16th at our usual venue (DAI in Nuremberg) at the usual time (contestants please arrive at 6:30, general public please arrive no later than 6:45, contest starts at 7 p.m. sharp). 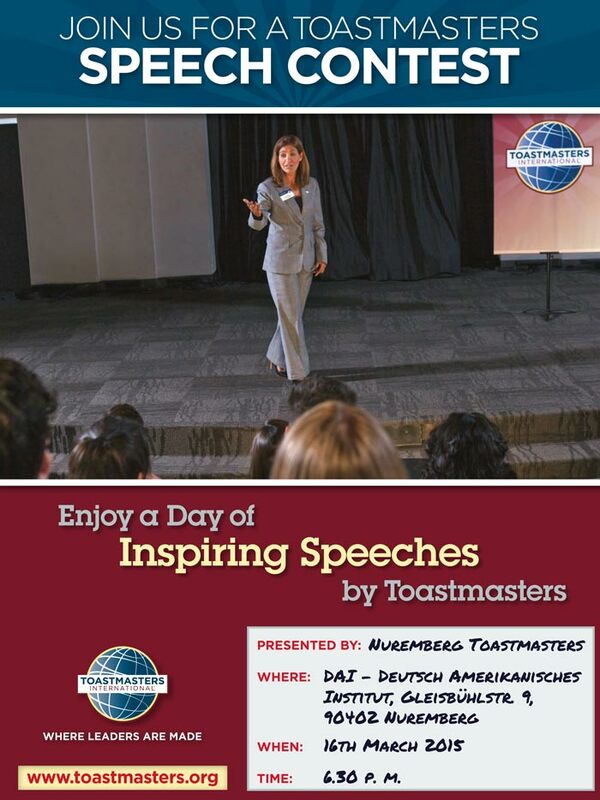 You will have the opportunity to hear wonderful speeches and several evaluations for one particular speech. This can mean a huge learning curve for you. How will different people be looking at a speech and give their feedback in a well-structured, friendly yet helpful and constructive manner? You will be surprised! Hope to see you all there.